ReThink Mathematics, together with MasterTrack Solutions, provides resources, professional development training and consulting services to support elementary schools build highly successful math programs. Teachers love how simple, practical and effective the program is to implement in their classrooms with any textbook series. With ReThink Mathematics’ resources and instructional strategies in place, schools' success in mathematics soars! MasterTrack Reporting and Progress Monitoring Software: ReThink Mathematics provides teachers with MasterTrack, a simple to use management system to organize weekly student data and easily monitor every students' progress. 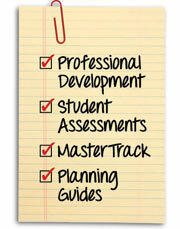 MasterTrack Reports clearly identify student needs standard-by-standard, promoting weekly response to intervention. ReThink Mathematics’ provides schools with Instructional Units. Teachers love having a clearly defined instructional roadmap mapped to their classroom textbook series. All instructional units accommodate remediation and enrichment at each grade level, keeping with the goal of moving all students to mastery. ReThink Mathematics provides each grade level teacher a bank of "quick-check checkpoint" classroom-based assessments that are administered on a weekly basis to monitor student progress. ReThink Mathematics also provides "benchmark" assessments teachers can administer at the beginning, middle, and end of the school year to chart growth. Schools have the option to use ReThink assessments or they can use their own standards-based classroom assessments. ReThink Mathematics provides both onsite and online professional development for teachers, instructional support staff, math coaches, and principals surrounding the goal of moving all students to mastery. ReThink Mathematics' professional development can be customized to fit individual schools' needs. Check out our MasterTrack-ReThink Workshop Schedule to see if we have a workshop in a nearby city!